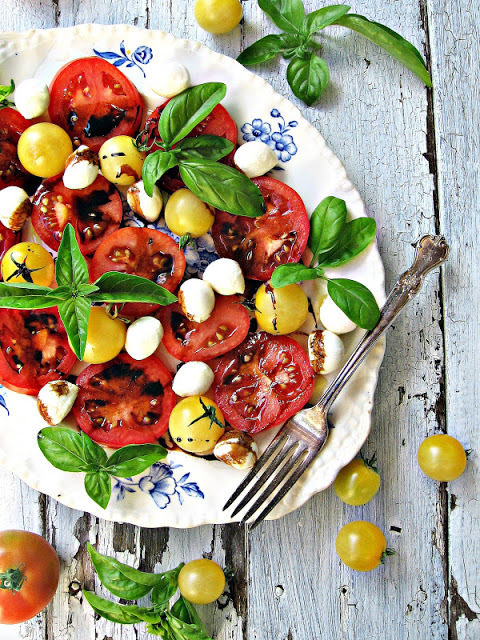 Warmer weather seems to bring our attention back to the beauty of eating locally. As our city crawls out of hibernation after a harsh winter, we begin to turn our thoughts to the growing season that is now underway. One of my favourite things about summer in Saskatoon is the veggies! 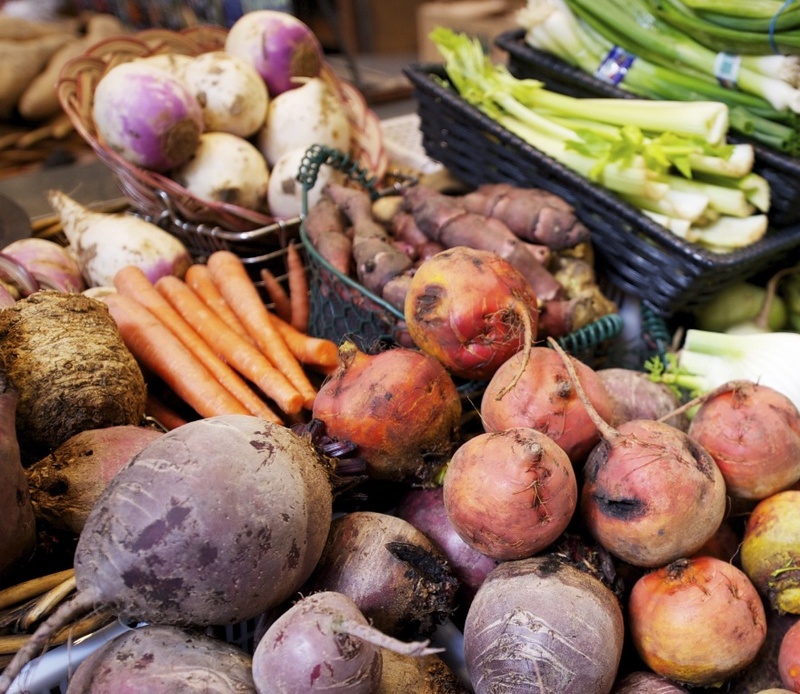 Local produce seems easier to come by, as we see a surge in the number of vendors at the Farmers' Market, and the variety of locally grown vegetables available for purchase expands. The warm weather, of course, also brings the opportunity to get your hands dirty and make DIY summer vegetables happen. Its almost June, so it's time to get rolling on the gardening plans for those of us who wish to tackle it ourselves. I noticed people working away at the Saskatoon Food Bank's Garden Patch the other day, which served as a little reminder for me to head to Early's Farm & Garden Centre this weekend to pick up the necessarily supplies and seeds. One positive thing about our climate is that as Saskatonians, we are motivated to squeeze out every last drop of precious summer, and we enjoy it that much more. I know I enjoy the fresh, locally grown produce so much more this time of year, partly because of the camaraderie that happens surrounding it. Food is often the centre of community, it has been since the earliest civilizations, and I'm so excited for the many upcoming opportunities for our city to come together in celebration of eating this summer! An event in support of Slow Food Saskatoon, a local community organization promoting local, sustainably-raise food, is happening on May 31st in Saskatoon. Join the conversation about good, clean and fair food during this convivial evening that celebrates the fine things in life: fine home-cooked local fare accompanied by readings that reflect on urban life within nature, courtesy of the U of S MFA in Writing Graduate Students. Vegan-friendly, gluten-free friendly, and kid-friendly too! Cash bar, raffle for Made-In-Sask art, edibles, and books. I want to experience the unique and exciting. When going on vacation, I'm more interested in finding the unique local hotspots than in going to the same old chain restaurants where my experience will not change. When I visited California, I had to hit up In-N-Out Burger, since it is a local phenomenon and a great burger joint. On our honeymoon, my wife and I found Caffe Fantastico in our Parkside Victoria Hotel. It was local, unique, and fantastico. Its a wonder that while traveling, our eyes are often drawn to the unique and fascinating, yet when we return home we don't realize that Saskatoon has some unique gems of its own. In 1949 a green bus rolled off the assembly line in England. It was designed to be used as a rural bus throughout the countryside. However, World Ward II had just ended, and London was short on buses. So, the green bus was painted red and put to work in the capital city. It gave London 17 good years before retiring to North America to be used as a tour bus at Niagara Falls. Eventually this run came to an end as well, and the bus was purchased by a restaurant in Regina. In 1985, Laurel Beaumont purchased the bus and used it as a mobile fish and chips bus throughout Saskatchewan. Travel became quite difficult with the old bus, so she looked for a permanent location for her mobile restaurant. In 1989, Bus Stop Refreshments parked across from the Delta Bessborough and opened for business. It has been here ever since. 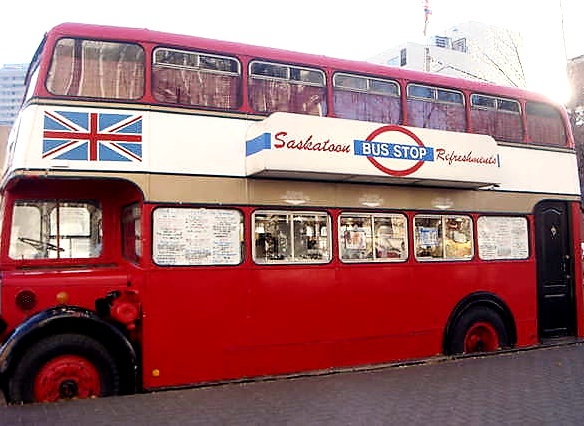 The unique double decker bus now serves hotdogs, ice cream, and cold drinks in downtown Saskatoon from April through October. It has become a favourite among young and old alike for the past 25 years. I had my most memorable experience at the Bus Stop when my whole family got together to spend the afternoon entertaining my sister's kids at the Forestry Farm. Afterwards, we decided to go for ice cream. The Bus Stop was a little farther out of our way, and we passed several ice cream chains on the way. We could have just as easily gone to McDonalds or Dairy Queen, but we wanted something more unique. In my opinion, the uniqueness of a local gem like the Bus Stop has a substantial impact on making an experience memorable. On this particular trip, I remember debating between getting an ice cream cone or a milkshake. Ice cream seemed like the obvious choice, but I was thirsty so I chose a raspberry milkshake. I was not disappointed. I now get milkshakes every time I go. Although the Bus Stop is known for its ice cream, in my mind, milkshakes are its best kept secret. As we walked by the river enjoying our treats, I remember feeling like I was enjoying a taste of heaven. The grass is green where you water it (cue Justin Bieber song). We often feel as though we need to travel away from our city in order to experience the unique and interesting, forgetting to look at the beauty and excitement that can be found in our own backyard. Sometimes it is right under our noses, a historical treasure on the banks of the Saskatchewan River. It is Top of the Hops Weekend! Pick your favourite poison to enjoy on the patio this summer, with samples from over 200 liquor, beer, and wine brands featured at Top of the Hops. Doors open at 6:30 tonight. You can get tickets at the door, or in advance. There are over 85 vendors sampling a huge variety of libations, and some great food accompaniments as well! I scoured the web for a list of vendors to see which of our local alcohol producers are going to be in attendance, but didn't find it if such a thing exists. I guess it will be a surprise! I am hoping that many of the local guys will be at Top of the Hops so I can sample the flavours and products I haven't tried. As I've got booze on the brain, I thought I would share some cocktail recipes that would definitely accompany the warm weather we are expected to have this weekend (fingers crossed for no rain!). 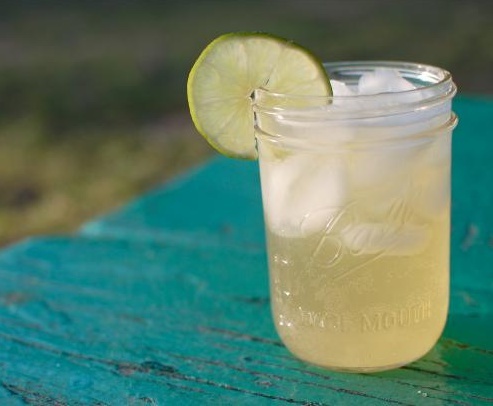 I love, love, love supporting local brands, so I thought I'd put a Saskatoon spin on a few recipes that are a must-try for the patio, poolside, or lake this summer! They all include great locally-made liquor and beer. This one is easy. 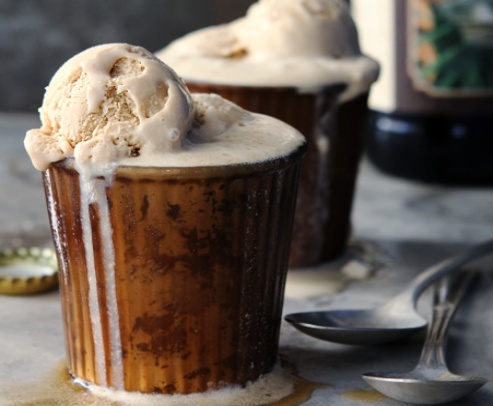 Pour Double Chocolate Porter from Saskatoon Brewery over your favourite ice cream, scooped into glasses. Make this extra awesome by choosing locally made ice cream from Prairie Sun Orchard. 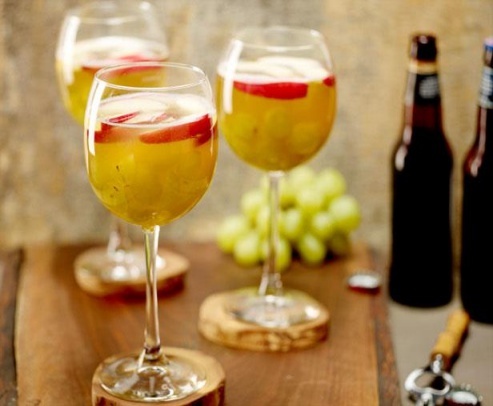 Combine the grape juice, vodka, grapes, apples, and oranges in a pitcher. Refrigerate at least 1 hour, and up to 8 hours for the flavours to infuse. Fill glasses half way with the grape juice mixture and some more fruit. Fill the rest of the glass with beer. Also very easy. Combine all ingredients together in a large glass. Mix, then add the ice. Voila! It felt like we were in Narnia these last few months - always winter, but never Christmas. As May has, for the most part, brought the warm weather our way, I have begun to experience once again my favourite aspects of Saskatoon. For much of the winter, I huddled up in my house, drank chai lattes, and rotated between reading a good book and following my latest favourite TV show on Shaw on Demand (right now its Fringe). But the moment it got warmer outside, everything changed. Saskatoon came to life. Barbecues began flaring up, people got together, and true community started to happen. 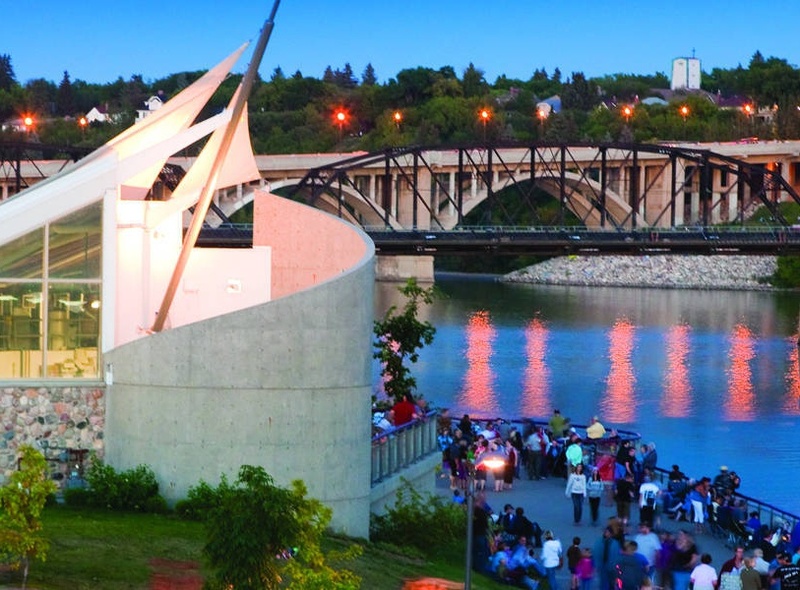 That is what I love most about Saskatoon - a big city with a community feel. There is so much to look forward to over the summer months. 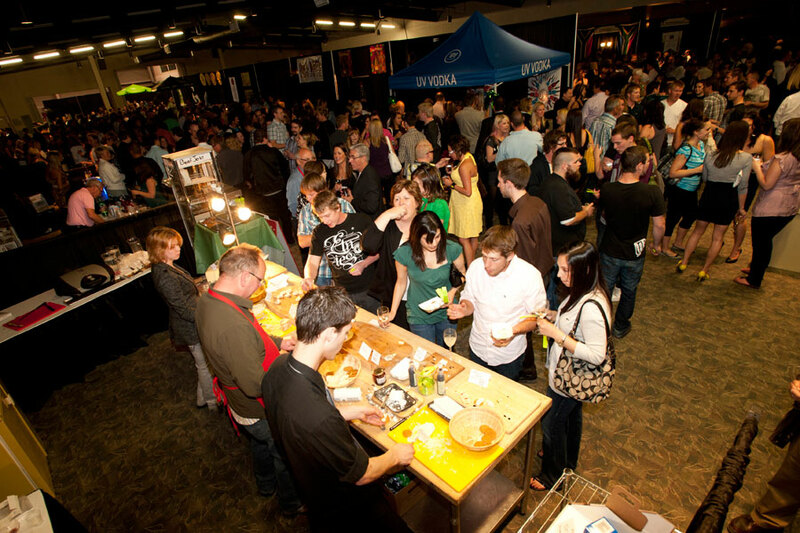 Some of my favourites are the tried and true Saskatoon classics, including Saskatchewan Jazz Festival, Taste of Saskatchewan, and Folkfest. Each of these events promote our city's community feel, through sharing music, good food, and cultural experiences. My wife and I have been living in our home in one of the newest Saskatoon neighbourhoods, Evergreen. It is an exciting neighbourhood to be a part of, as it is surrounded by a combination of parks, open fields, and nature in general. The houses are aligned so that the majority of residents receive the full benefits of the sun, and a walking path is in the works to enable us to navigate throughout the entire neighbourhood on foot. These were all major draws for us, but the icing on the cake was that our house, along with the majority of other houses in Evergreen, had a front porch. In the middle of the nineteenth century, the American front porch had come to represent the ideal of "community". 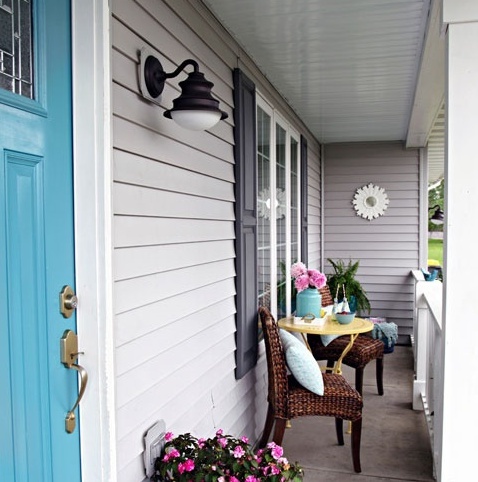 Since the front porch existed in between the private home and the community outside, it was seen as an area where community interaction could take place. Families would retire after supper to their front porches and would greet each passing neighbour walking down the street that evening. The porch brought the community together as it encouraged interactions with, and awareness of others. My wife and I are bringing the front porch back. We went to Home Depot last summer, which is a story in itself, to buy patio furniture and a barbecue to fill the space. Right away, we noticed increased interaction with our neighbours and community. A simple act like a smile, a wave hello, or briefly sharing commentary on the weather made us feel even more at home in our new home. We love how this is happening again this summer, as the warm weather drives people in our neighbourhood out onto their porches. Even if our neighbours don't talk to us, we still get to watch them, which may sound creepy, but who hasn't done a little people watching? We have also enjoyed the new connection we feel with nature as we sit outside watching the sun set. Yes, we are bringing the front porch back, developing community in our neighbourhood, and in turn developing feelings of community in our city. I love the prairies and the small, hidden wonders found in nature surrounding us right here in Saskatoon. We don't have to leave the city in order to immerse ourselves in the beauty of the great outdoors. If you are a nature buff like me, you will want to plan your next week around Saskatoon's second annual NatureCity Festival, powered by Wild About Saskatoon, commencing on Sunday after a kick-off at the Farmers' Market on Saturday! The festival includes a full week of (mostly) free activities that are fun for all ages! Take in an educational keynote event, get your hands dirty aiding in spring clean up, spend time in a community garden, join a guided walking tour, or enjoy a relaxing outdoor musical performance. The festival presents many, many options to enjoy time spent outside in our beautiful city. Check out the week's schedule here. I recently discovered Wild About Saskatoon, a local entity that describes itself as "an informal collective dedicated to the conservation and enrichment of wild lives and wild places in and around Saskatoon". Sounds pretty cool to me! Interested in doing some exploring on your own? Check out this awesome interactive map that Wild About Saskatoon has put together, showcasing the best spots to experience nature, right in our own backyard. I plan to refer to it anytime I'm presented with a beautiful day and nothing to do this summer! Stay connected and informed on other events for nature lovers, through Facebook and Twitter! See you out there next week! Should you buy a newer or older home in Saskatoon? It is expected that around 1,200 brand new, non-landscaped homes will be purchased this summer in Saskatoon. In an effort to bring down initial housing costs, home builders have cut some previously expected items and left them for the purchaser to do later. These "cut" items include a garage cement pad, walkways, a deck, fencing, landscaping, top soil, sod, sprinklers, and a completed basement development. 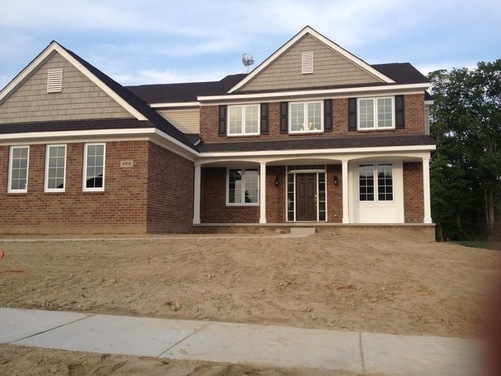 Adding these post-purchase extras brings our housing price from $430,000 to over $500,000 once everything is completed. This bears the question- is it better to buy a new home or an old home? Initial costs are similar between new and old, but what you spend your money on afterwards is much different. Here is a breakdown of the pros and cons of buying new or old. A newly built house needs time to settle. This can cause cracks in the foundation, door frames, and that new cement path you just had built. You are forced to manage home projects including a garage cement pad, walkways, a deck, fencing, landscaping, and a basement development. While you have to manage home projects, you can make it the way you like it, instead of living with what someone else has done and is too expensive to change. New homes are more energy efficient, convenient (built-in dishwasher, central vac, wiring systems are easy and networked), and not in need of maintenance. With an older home you will have many of these "cut" items, but they may be outdated or ugly. Previous owners may have done the home renovations themselves, which often means it was done poorly. It costs more to rip out old construction and then redoing it, than starting with a clean slate. 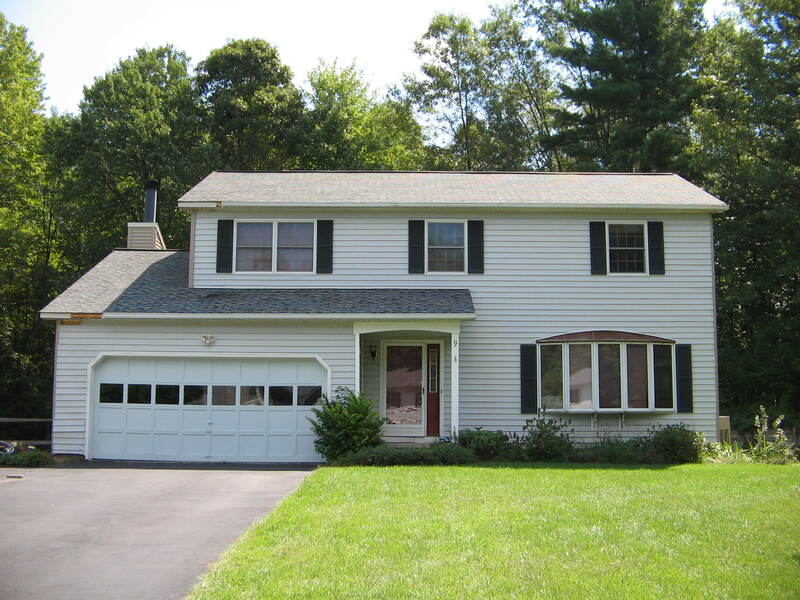 The wiring, plumbing, furnace, and water heater are old and possibly in need of maintenance. An older home generally is part of a more established neighbourhood with longer term neighbours, mature trees and foliage. Larger yards are another bonus of buying old, because builders were able to build on larger lot sizes when land prices were cheaper. The decision between old or new is a difficult one. When my wife and I were going through the pros and cons of each, we decided we wanted to buy new. Our personality types make us a little extra picky and we didn't like how other people had "renovated" their homes before trying to sell them. We figured we would have to rip everything out and start over with these older homes, so for us, buying new made a lot more sense. Each person taking into account their personality and preferences are going to come to different conclusions, but it is important to thoroughly consider what you want before making the decision between new or old. Sometimes I feel like I need a little kickstart or a reset button to launch me into a time of healthy eating. Most of us want to look and feel our best as the weather gets warmer and the layers start coming off, but it can be challenging to get out of the "winter eating" rut and step into spring with motivation to eat clean. I noticed an upcoming event today that I think could be just what I need to get on the right track with fuelling my body with healthy, nourishing food this spring and summer. 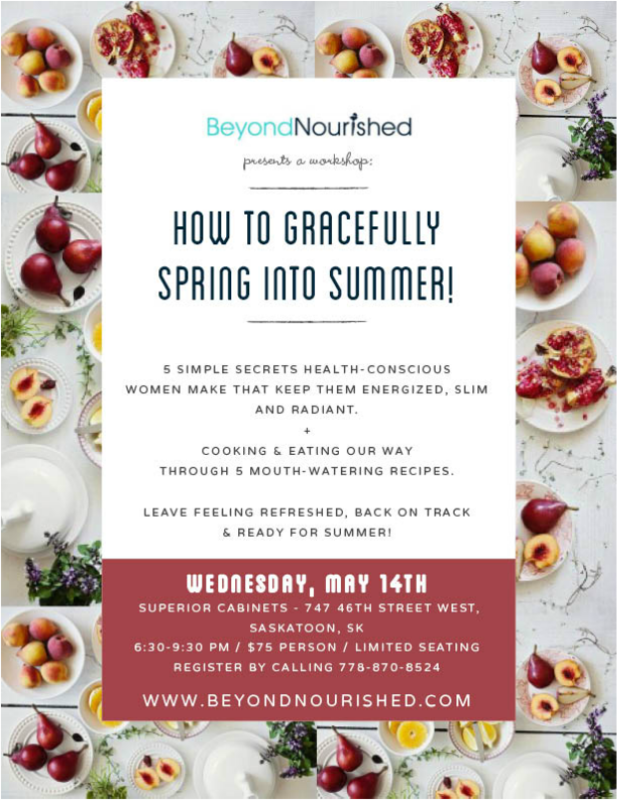 Beyond Nourished is bringing hands-on nutrition education to Saskatoon on May 14th, with a workshop held at Superior Cabinets. Tickets are still available for the "How to Gracefully Spring into Summer!" workshop. This event sounds like a great way for local women to come together for a fun, educational, and inspiring evening, filled with great food. What could be better than that? Check out the poster for the details! If this event intrigues you as it does me, you can also order tickets online here. You might want to jump on this, as there is limited seating available. Visit Beyond Nourished's website for more details on the philosophy and vision of this program. The weather is warming up in Saskatoon, and while I can't wait for summer and all of the joys that come along with it, I can't help but think about the additional tasks that this season demands, especially as a home owner. “Honey, could you mow the lawn?” isn’t something the average guy is eagerly anticipating every Saturday morning after a hard week at work, but it comes nonetheless. Thankfully, there is an often forgotten solution to this problem. And no, I’m not talking about bribing the neighbour kid to mow it for you. I like getting rid of problems from the root. As the temperatures have begun to rise, the idea that I have been toying with is installing artificial turf instead of grass. This idea became even more enticing when I realized that not only would I not have to mow anymore, but I would also get out of watering, fertilizing, aerating, and weeding. Artiﬁcial Turf is made to look like real grass with thatch ﬁbres to keep all the blades facing up. The grass moves like real grass, looks like real grass, and is soft like real grass. The lawn is strong enough to withstand a dog playing with it and is free of the bugs that are regularly found in real grass. Brown or dead spots are also not a factor as the turf looks great at all times. The only maintenance required is brushing it twice a month and washing it down if anything spills on top. Although the price of installing turf is a little daunting at ﬁrst, after factoring in the maintenance costs of real grass incurred every year, it isn’t that bad. It is estimated to cost around $2,000 a year to keep a natural lawn looking pristine. Over a 10 year period, this would add up to $20,000 in costs, not including the price of your time maintaining it. The purchase and installation of 1500 square feet of synthetic grass costs about $11,000 with the option to have some rock and fabric portions to lower the price to about $8,500. Around year 5 would be the break-­even point cost wise, and since artiﬁcial turf has a lifespan well over 10 years, the savings could be enjoyed for many years to come. 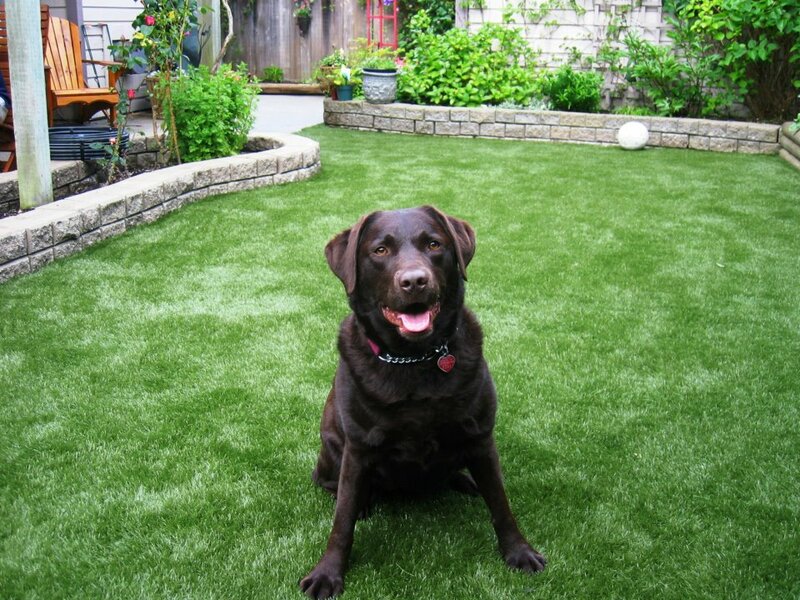 In Saskatoon, there are a number of quality artiﬁcial turf installation companies. 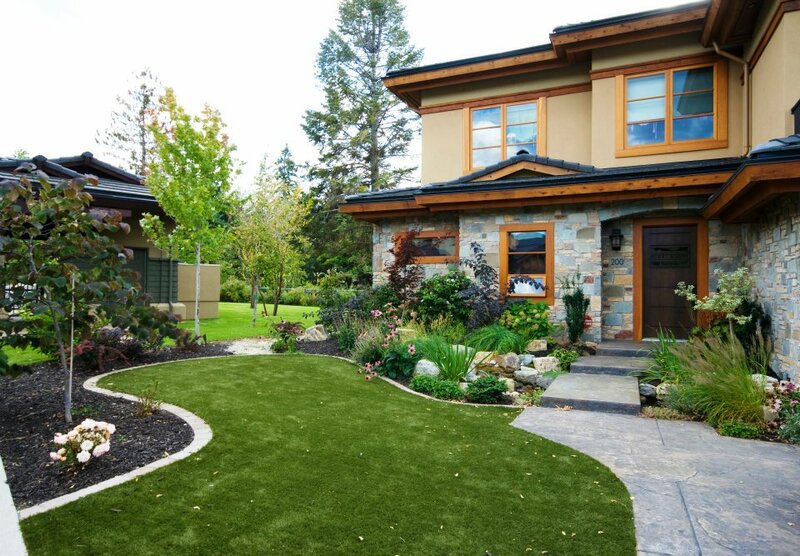 Featured on Trusted Saskatoon, Perfect Turf is a Canadian company that prides itself on providing the best customer service, and the fact that they are the only company to manufacture all of their own materials for quality control. They even offer a Lifetime Installation Warranty. Comparable businesses include EZ-­Grass which offers an 8 year warranty, and SYNLawn, who offers a 12 year warranty. Each company claims to have the best quality materials, but I feel like I can trust Perfect Turf more because the materials are constructed by the company itself. I’m leaning towards going with them. While I still haven’t solved the problem of my wife’s to-­do list and probably never will, this is deﬁnitely a step in the right direction. What a great feeling it would be to cross off mowing, watering, fertilizing, aerating, and weeding for the foreseeable future. When people walk past my lawn it’s going to look perfect year round and I will have put very little effort into making it that way. Now if only I could get the dishes to do themselves? I guess that’s what kids are for. We officially launched My Saskatoon this week, and had our first TV interview! Our CEO, Allison Thiessen, had a great time on the air this morning discussing who we are and what we are all about. We are so excited about what this website can do for our city, and we can't wait to feature more local businesses! If you know of any great locally owned shops, restaurants, or service providers that should be a part of My Saskatoon, let us know in the comments! Your browser does not support frames. &amp;amp;amp;amp;amp;amp;amp;amp;lt;a href="http://globalnews.ca/video/1318634/my-saskatoon-website" data-mce-href="http://globalnews.ca/video/1318634/my-saskatoon-website"&amp;amp;amp;amp;amp;amp;amp;amp;gt;Click here to view the frameless video.&amp;amp;amp;amp;amp;amp;amp;amp;lt;/a&amp;amp;amp;amp;amp;amp;amp;amp;gt;. We look forward to enjoying and sharing all that our city has to offer this spring and summer! I love food, and food is one of my favourite things about Saskatoon. As a fairly small city in the grand scheme of things, I feel like our restaurant options and the number of local producers here is pretty incredible. I eat out a lot, and I go for the local guys as often as possible. I enjoy atmospheres that are personality-injected and slightly off-beat, and flavours that are unique. I think it is so important to remember that the food scene in Saskatoon is of such a high quality, and is so diverse, because of the people behind the growing, the preparing, the cooking, the presenting. One thing I love about the Farmers' Market is being able to see the face of the person who grew or raised the food that I purchase. Lately I've been hearing more about the talented Saskatonians who are behind the best restaurants in Saskatoon, and it makes me enjoy the food and the ambience of these local spots all the more. 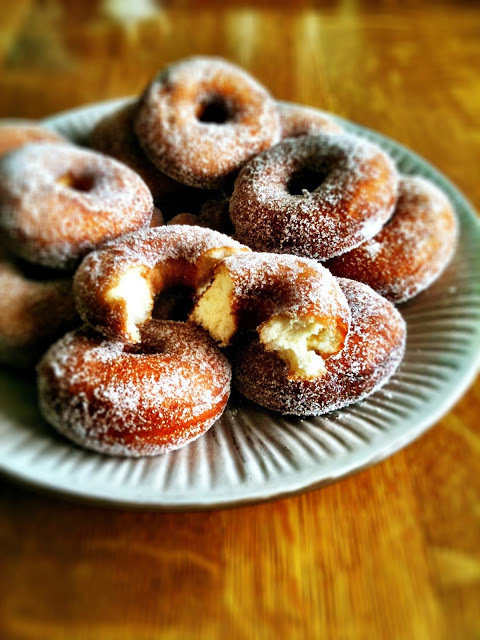 I recently came across a really great local blog about- you guessed it- food. Saskatoon-written, no less. What I love about this blog is not its gorgeous, mouth-watering, hunger inducing food photography, and not the enticing recipes that go along with the photographs. It's not the engaging local restaurant reviews. It's the person behind this blog, whom I have never met, but who's personality and obvious true love for food is evident on every page. If you love Saskatoon food as I do, and enjoy feeling that connection to the locals behind it, pay sweetsugarbean a visit. I promise you will be inspired. I've added a little bit about its author, Renée Kohlman, below. This was taken straight from sweetsugarbean, and I hope reading it will encourage you to click through to her blog. 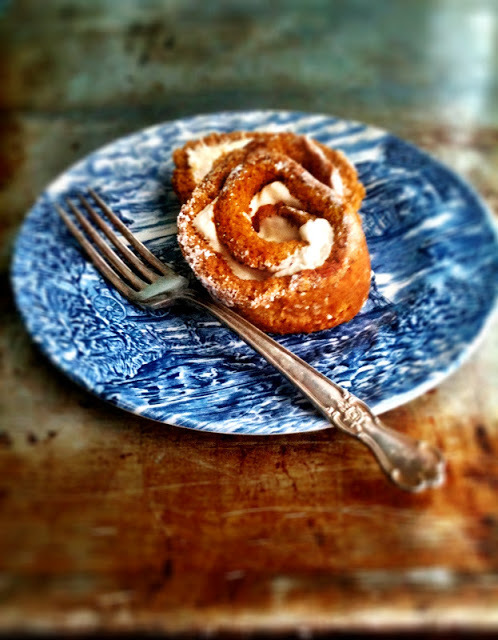 Sweetsugarbean is a combination of my favourite things: cooking, food photography and writing. Cooking from scratch is one of the best things you can do for yourself and those you love, and I'm so happy to share my recipes with you. I'm super fortunate to make a living doing what I love...and to be in the food industry for as long as I have, you really do have to LOVE it. I've worked in various corners of the professional kitchen, most recently taking the position of pastry chef at a brand new gluten free/nut free/organic/whole foods restaurant here in Saskatoon called Leyda's. Food truly is my passion, and I don't stop living it once I leave the work kitchen. I still come home and cook for myself, family and friends. Eating well, using as many fresh and local ingredients as possible, means the world to me. I feel most at home in my little green kitchen; it's where I feel grounded and happy. Be it boiling chicken stock for soup, or whipping up a batch of whole wheat biscuits on a Sunday morning, these simple pleasures are a part of my everyday life. With a Bachelor's Degree in Fine Art and a diploma in Culinary Arts, my interest and education in both these areas are reflected on these pages. I'm a self-taught photographer and I use a Canon A520, as well as my iPhone to take the photos. For the recipes in this blog I try to use all good quality, natural ingredients - local and organic if possible. Butter always, never margarine! When you start with good, wholesome products, you will make good, wholesome food. My garden is a busy place in the summer/fall and many of the vegetables will appear on these pages. If I can't grow it, I'll often pick it up from the local farmer's market, where excellent farmers are doing excellent work. Most recipes "come from my head", but I will give credit if I adapt it from another source. Inspiration often comes from just looking inside the fridge and seeing that I have a pound of apples, half a block of cream cheese and some puff pastry to use up. I hate throwing food out, so "clean out the fridge days" usually turn into tasty treats! Baking and desserts often appear here, only because I have a horrible sweet tooth and I love to bake with all my heart. While I do joke about loving butter and bacon (a lot!) I also try to make food that is healthy and not too fussy. I'm a comfort food kind of girl, so I can guarantee you will not see anything on the blog about foie gras or truffle oil. Cheese and chocolate, that's another story.